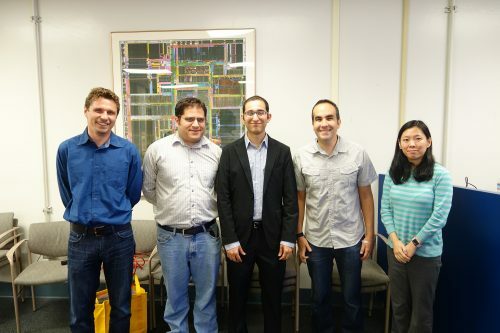 Farhad Hormozdiari successfully defended his thesis,”Statistical Methods to Understand the Genetic Architecture of Complex Traits,” on Tuesday, May 17, 2016 in Boelter 4760. His talk, which is posted on our YouTube channel ZarlabUCLA, discusses methods for applying CAVIAR to understand the underlying mechanism of GWAS risk loci, introduces eCAVIAR, a statistical method capable of computing the probability that the same variant is responsible for both the GWAS and eQTL signal, while accounting for complex LD structure, and proposes an approach called phenotype imputation that allows GWAS computation on a phenotype that is difficult to collect. In: Bioinformatics, 30 (12), pp. i204-i211, 2014, ISSN: 1367-4811. In: J Comput Biol, 2013, ISSN: 1557-8666.